This story about Merge Records was published at Business North Carolina magazine in July 2011. I’m reposting it on my blog in celebration the label’s 25th Anniversary. 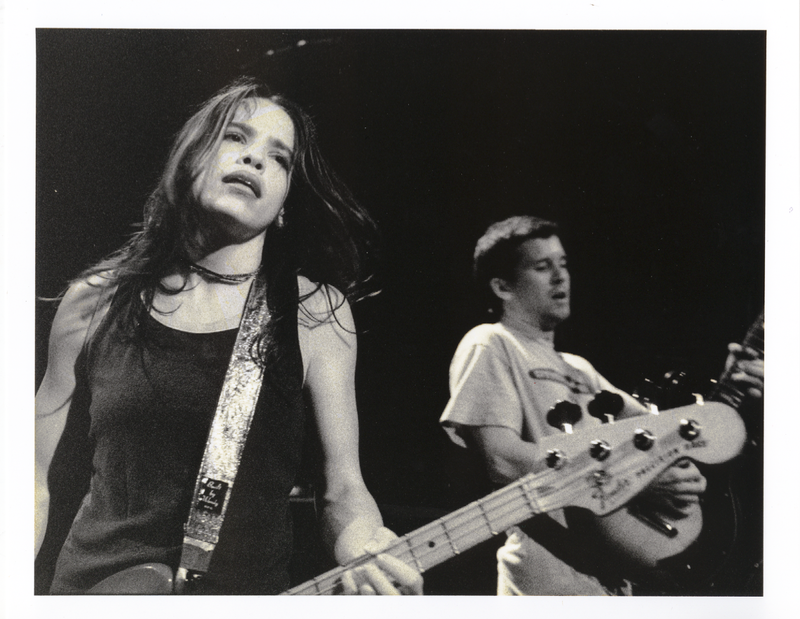 The photo comes from the cover of the Merge Records book Our Noise: The Story of Merge Records. It was shot by the excellent live-music photographer Brian Vetter. Happy 25th, Merge! For longtime North Carolina punk-rockers Mac McCaughan and Laura Ballance—founders and co-presidents of the Durham-based record company Merge Media Ltd.—the win was a glorious surprise. Merge had released Arcade Fire’s third album, The Suburbs, six months earlier, and artists on independent labels don’t normally win Grammys. “To get the Arcade Fire’s name out there to all these people who don’t care about Merge and don’t care about alternative music is big,” McCaughan says. “You rarely have an opportunity like this to get in front of these people.”To many of these people—mainstream pop fans unfamiliar with the critically acclaimed Canadian band or its Carolina-based label—Arcade Fire’s win was a shock. 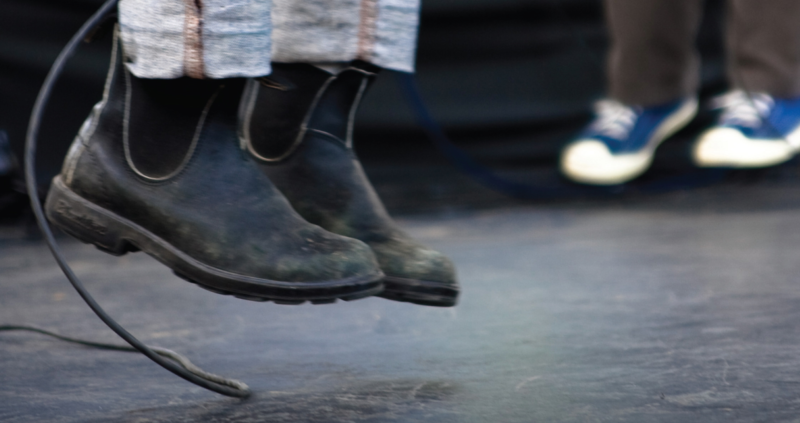 YOU CAN’T BUY that kind of publicity on an indie label’s budget, McCaughan says. The 44-year-old musician and entrepreneur is sitting with Ballance at a window table in a small coffee shop near the Merge Records headquarters, a blond-brick building tucked between an alleyway and a furniture store on Chapel Hill Street in downtown Durham. McCaughan is dressed in casual indie-geek chic: a blue sweater, jeans and sneakers. Ballance, also 44, is more stylishly hip: designer glasses, a brown RLX Polo Sport hoodie, muted-green shirt and turquoise necklace. They come here often to sip coffee, nibble on croissants, discuss business or—in today’s case—talk to a reporter about the surprise success of their little record label that could. Over the past two decades, Merge has grown from a tiny punk-rock label operated out of Ballance’s Chapel Hill bedroom into one of the longest-lasting and most well-respected independent music companies. Not bad for two people who never expected to become record executives. “We didn’t start out with any expectations at all,” McCaughan says, his high-pitched and somewhat squeaky voice sounding like it belongs more to the president of a computer software company than to that of a record label. “Our ambitions were pretty small in terms of what we thought we could do.” In fact, McCaughan and Ballance were barely out of their teens when they started Merge. Romantically involved, they were only interested in starting a label to put out singles by their own Triangle-based band, Superchunk, and some of their friends’ bands. The only reason to start an indie label, McCaughan says, is to release fringe music that mainstream labels wouldn’t consider economically viable. Indie labels depend more on fan loyalty and conservative budgeting than big record sales for their survival. “If someone starts up an indie label and it fails because of lack of record sales, then that person started it with strange expectations.” He and Ballance declined to talk about the private company’s finances. So what is indie rock, and what does it mean to the popular-music industry when a band such as Arcade Fire, on a little-known label run out of a nondescript building in Durham, wins a Grammy? For one thing, it means that Internet-era indie rock—once a network of small, regionally based labels featuring adventurous musical styles connected by underground print music magazines and low-budget touring—has exploded. Today, any kid in his bedroom can not only read about bands from obscure music scenes on indie websites such as Pitchfork.com or Stereogum.com but can instantly listen to and download their music, often for free. That levels the playing field between major labels under corporate umbrellas and tiny mom-and-pop indies such as Merge or Saddle Creek Records, the Nebraska label of singer-songwriter Conor Oberst, whose I’m Wide Awake, It’s Morning album under the name Bright Eyes reached the Billboard Top 10 in 2005. MERGE’S SUCCESS did not come overnight, and it is not solely the result of Arcade Fire record sales. The label’s first band—McCaughan and Ballance’s Superchunk—was a critical success early on and in the ’90s sold more albums than most of its indie-rock peers. Merge and Superchunk both officially formed in 1989, and Merge has established itself over the years by consistently signing reputable artists—bands such as Texas-based Spoon and popular New England singer/songwriter Stephin Merritt, who puts out electronic-based folk music under the name Magnetic Fields. Among mainstream record executives, McCaughan is seen as a sort of taste-making indie-music guru. “A recording with the name Merge on it is listened to promptly and seriously by anyone in the alternative-rock world, both in the United States and around the world,” Danny Goldberg says. He’s president of New York-based artist-management company Gold Village Entertainment Inc. and in his 40-plus-year career has been president of Atlantic Records and chairman and CEO of Warner Bros. Records and Mercury Records. Goldberg, who has worked with bands ranging from Led Zeppelin to Nirvana, attributes McCaughan and Ballance’s Midas touch to instinct rather than calculating business sense. “It’s palpable that every release on Merge is an expression of their artistic taste, without regard to transient commercial trends,” he says. To McCaughan and Ballance, Merge’s success is more a combination of instinct, timing and luck. As a teenager growing up in Durham in the early ’80s, McCaughan followed bands on early indie-punk labels. After graduating from high school, he left North Carolina for New York to study history at Columbia University. During a break between his sophomore and junior years in 1987, he got a job at Pepper’s Pizza in Chapel Hill, where, scruffy and dreadlocked, he met a fellow musical misfit who dyed her hair black, wore dark makeup and clothing and listened to Goth rock. Born in Charlotte and reared in Atlanta and Raleigh, Ballance was studying anthropology at Carolina. 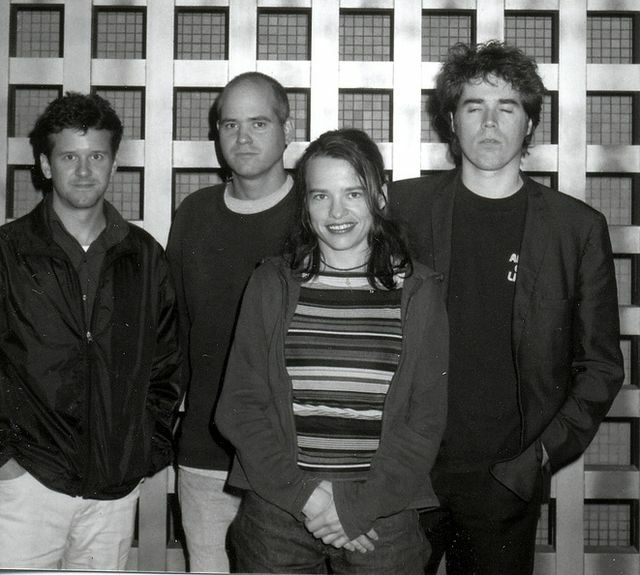 After they formed Merge to put out Superchunk singles, they quickly found that the band was outgrowing the label and decided to sign it to New York-based Matador Records. They borrowed money wherever they could to pay for Merge’s earliest singles—friends pitched in $200 here; family members, $500 there—and after the records were sold, normally at punk shows, they would pay off the loans and start recording another one. Merge’s first official release, on June 1, 1989, was a cassette by a band called Bricks. Over the next 12 years, the label’s success was in direct proportion to Superchunk’s. By 1994, after three successful albums on Matador and several singles on Merge, the band parted ways with the larger label. By then, Superchunk had become big enough to land a performance on Late Night with Conan O’Brien, and Merge had moved out of Ballance’s home. When they released Foolish that year, it sold a respectable 40,000 copies. Even today, hints of dissonance appear when the partners, both now parents married to other people, discuss business, but it’s somehow clear that this yin and yang are part of what has made the company successful. Sitting in the Durham coffee shop, Ballance gently argues with McCaughan over the timing of Merge’s move from her apartment. Merge became an even hotter property to younger artists, and label loyalty reached a new high. It signed Louisiana psychedelic band Neutral Milk Hotel and then Spoon. Then, in 2003, Arcade Fire, already fans of Neutral Milk and Magnetic Fields, needed a drummer. According to Our Noise, a friend of the band suggested they approach Howard Bilerman to fill in. Bilerman, a Canadian recording engineer, wasn’t too impressed with what he had heard, but an impromptu live performance convinced him that the band had potential and persuaded him to join. Because of an early interest in Superchunk, Bilerman was friends with Ballance and McCaughan, and it turned out Merge was Arcade Fire founder Win Butler’s ideal label. Despite Bilerman’s reluctance to impose on the friendship, he sent Merge a letter and a CD. After hearing it, their expectations were modest, Ballance says. “We were like, ‘This is great. I think maybe we could sell 40,000 copies.’” It sold 60,000 out of the box, more than the 50,000 it takes for an indie album to be considered a success nowadays. Arcade Fire, they figured, might one day be as big as Superchunk. INSIDE THE MERGE office in Durham, exposed brick walls display lots of colorful, primitive artwork from one of indie rock’s patron saints, assembly-line artist Steve Keene. The basement is a maze of shelves housing the growing catalog of records and CDs of the more than 80 acts on the label. But the space is not overly ornate, in large part due to Ballance’s fiscal restraint. “We’ve always been able to turn a profit,” she says, “because we’ve never spent a lot of money on things we don’t need. And that’s only sensible: If you don’t have the money, you can’t spend it. That was particularly true in the early years, because it’s not like anybody was giving us a line of credit.” Big labels give executives expense accounts to court acts and rely heavily on record sales to remain afloat. Merge is a niche brand that signs acts who want to release records under Merge’s name. “If you ask someone who works for Sony, ‘Who do you want to sell records to?’ they’ll say they want to sell them to everyone who has access to a Best Buy. But for us — that’s great if those people want what we have. That’s awesome, and we want them to be able to get it. But we’re not swinging for the fences in that way,” McCaughan says in Our Noise. The technological developments of the last decade have enabled Merge to save money on marketing, but records are harder than ever to sell, due to the blessing and curse that is the Internet. Now that fans can find music online and download it for free, the kinds of albums that once sold millions of copies often stall out at around 500,000. Despite the hubbub surrounding Arcade Fire’s first two albums — 2004’s Funeral and 2007’s Neon Bible, which sold 92,000 copies upon its release — last year’s The Suburbs had sold only 486,000 going into the Grammys. According to the music trade magazine Billboard, sales spiked 238% after it won, but Ballance calls that a “little bump,” not the kind of numbers one would expect for a band that packs arenas. Still, McCaughan and Ballance say the digital age’s pros far outweigh its cons. After all, pre-Internet an indie-rock band would never have reached Arcade Fire’s popularity without moving to a major label. And that’s part of the reason the band has remained with Merge: They can release No. 1 records without a bunch of suits sticking their hands in the mix. On a major label, executives tend to mold young artists into hit-making machines, and if those artists don’t deliver, they’re dropped. With their smaller budgets and modest sales expectations, independent record labels can release music that’s more adventurous than most mainstream pop. But to do that, indie-label owners must think very differently than executives at corporate labels like Capitol or Warner Bros. Major labels expect records to sell well, and to that end, they offer new artists comparatively large advances — $150,000 to $300,000, typically. With those advances, artists are normally responsible for paying expenses such as producers’ fees, packaging, distribution, marketing and promotional materials. An advance is like a loan, and the label recoups the money by deducting it from the artist’s royalties, usually 10% to 13% of the retail price of the album. Artists who fail to sell enough records to pay off their (sometimes extravagant) expenses are normally dropped from the label. Major labels typically retain ownership of an artist’s master tapes, so if the label decides not to put an album out, the music doesn’t go back to the artist, it goes into the label’s vaults, rarely ever to be heard by anyone except those who made it. Mark Kemp is a Charlotte-based freelance writer.